Have you ever wanted to take out a loan but couldn't because you didn't have enough financial history? Perhaps you are one of those who doesn't have a bank account or just don't trust the banking system? It happens you know. Cashalo, the Filipino fintech company committed to accelerating financial inclusion for all, today announced the launch of Cashacart, the Philippines’ first-ever, O2O (offline to online) basket financing solution. With Cashacart, Filipino consumers can access digital credit at 0% interest, for all their specific shopping needs via the Cashalo app and across a growing network of 250 retail partners - which include Robinsons Appliances, Robinsons Department stores, Handyman, Oppo, Cherry Mobile, and Memoxpress. Loans start at PHP 2,000 up to a maximum of PHP 19,999. Unlike traditional consumer financing solutions that are restrictive, Cashacart gives consumers the freedom and flexibility to purchase multiple products that they need whether it be appliances, electronics, household items, apparel, or school supplies and choose from a variety of payment options. The entire process is completed within minutes in a few easy steps: simply visit a Cashalo partner store and look out for a Cashalo representative who will help them complete a digital application in a few minutes. The application requires you to submit basic personal information and a valid ID. A customer then chooses a loan amount and payment terms of their choice. Upon approval a customer can shop for their basket of goods up to a value of the digital credit they have been approved for. Consumers in the Philippines have been clamoring for just this kind of innovative financing solution. Recently, Ms. Rose Ong, the newly elected president of the Philippine Retailers Association stated that, the share of online shopping in the country was only about 1-2% of total retail sales, and according to research by RF Group, 80% of online sales are still cash on delivery. 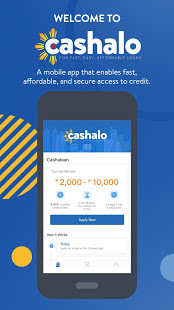 Consumers can also access the Cashacart financing solution through the Cashalo app which can be downloaded on the Apple and Google Play mobile app stores.